10k training and the 5 main workout types. 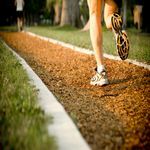 "As a part of a marathon training schedule - or as a seperate goal"
10k training has a major component that the 5k does not have. You need to take much more into consideration the duration of the event. This is especially true with 10.000 meters on the track. We are taking 25 laps around. Or 27 minutes to 1 hour of running on a hard surface for road races. If you look at almost any 10 km race you will see pretty open races up until the 6 to 8k. Just around the 6 or 8 k something happens..
those that are not, start to struggle. This has to do with the muscular demands in combination with the endurance demands. The 10k has a mechanical component and is great to combine with marathon training. The fact that the 10 k is such an endurance event (even more so than the 5k) makes it great to combine with marathon training. The fact that the 10k also has a very mechanical component (muscles) you need to train to get used to the impact on the legs makes it even greater. Those two facts and you have the 10 k as a good test leading up to a marathon or half marathon. A few 10 ks should always be part of your marathon training schedule.You can also combine the 10k work with 5k training as explained. Most successful marathon runners use the 10k training workouts in the beginning of their training cycle and make 10ks part of the marathon program. The same benefit for the beginner in marathon training. How to train the impact on the legs. Go hard. For track 10.000 meters on it is pretty obvious : you need to run those laps around the running track. Usually though, 2 sessions of 6-8 km total running is enough in addition to some shorter sessions. For road 10 km runs the track can also be used in a very smart way to prepare you for the road. Which means : track work for "a springy feedback"
Take advantage of the springy track! Running on the track gives you "feedback" from the surface more so than the hard road. It is elastic, it is springy. Now. 2 - 3 track sessions leading up to a 5 k or as a part of a marathon training program can give you a tremendous "feel" in the legs. In addition to that it helps for the general running form. Any runners that are training, on any level should do some work on the track. So what are recommended 10 k trainings ? You always have the easy training there. The long, easy runs are the backbone in your training. Then you have the more specific workouts. A few suggestions for 10k training sessions ; specific work. Ask yourself : which ones of these do I need at the moment ? The muscular training. This is sessions of 6-10 km in distance on a hard surface. Which means either the track or asphalt. Ideally, a range from 1 - 6 minutes of effective running and recoveries about half of the time you have run on the previous repeat. The "under distance" work. This is the mile-repeats / 1000-meter-repeats. On track or dirt/soft surface. These should be a total of 4 - 6 km / 3 - 4 miles in the whole session. The recoveries as long as the time run. If you do 3 x 1 mile repeat in 5 minute each, go for 5 minute recovery. Aim for your 5 k race pace. The progressive 10k trainings, with short recoveries. In these sessions, what you do is to have very short recoveries, from 15 - 30 seconds. For example you start a certain distance and finish in 1 minute. The next time, run 0.5 seconds faster. Continue running a little bit faster on each one. What you do here is to start off your "aerobic engine" (the endurance system) and slowly glide into more anaerobic (work with lactate acid in your legs). This helps the finish of a 10k. The pyramids. This adds another element to the muscular training. You play with speed and this helps your muscles adapt to the demands of the 10k. For example 30 seconds - 1 minute - 2 minute - 3 minute - 4 minute - 2 minute - 1 minute - 30 seconds of running. The longer, off track/soft surface 10k/half marathon stuff. This work should always be on increasing speed. Which means - the last repeat faster than the one second to last, which was faster than the one before. Typical sessions are 5 times 6 minute with 2 minute easy jog in between. Good luck with the upcoming 10k training, and click below to get back to marathon training schedule index.